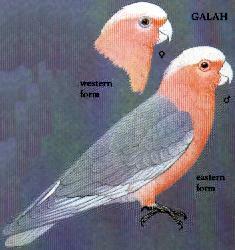 Small pink and grey cockatoo. Juv: Pink areas suffused with grey. Western birds (race assimilis) are paler with eye ring grey or whitish. Usually seen in loud noisy flocks. Voice: pleasant 'czzk-czzk'; loud screech. Nesting: much chewed hollow in eucalypt, lined with eucalypt sprigs The ground below is usually scattered with sprigs; 3-4 white eggs. Increasing in Tasmania possibly due to escapee pets.